Global emergency medical service product market expected to reach around USD 31.54 billion by 2024, growing at a CAGR of 6.77 % between 2018 and 2024. The emergency medical service is an important part of the healthcare system, especially for people who suffer sudden and unexpected emergencies. The report covers forecast and analysis for the emergency medical service product market on a global and regional level. The study provides historical data from 2016 and 2017 along with a forecast from 2018 to 2024 based on revenue (USD Billion). The study includes drivers and restraints for the emergency medical service product market along with the impact they have on the demand over the forecast period. Additionally, the report includes the study of opportunities available in the emergency medical service product market on a global level. In order to give the users of this report a comprehensive view of the emergency medical service product market, we have included a competitive landscape and an analysis of Porter’s Five Forces model for the market. The study encompasses a customer and region segments are benchmarked based on their market size, growth rate, and general attractiveness. 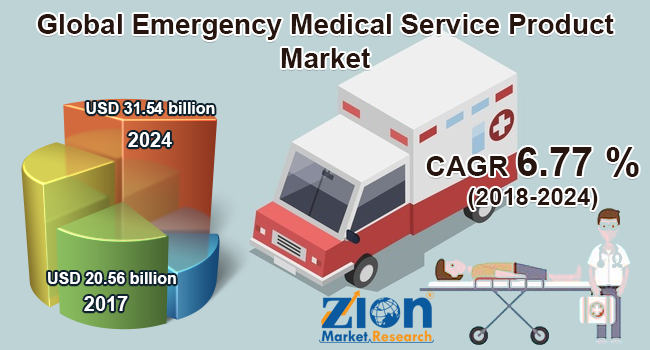 The study provides a decisive view on the emergency medical service product market by segmenting the market based on type, application, end-user, and region. All the segments have been analyzed based on present and the future trends and the market is estimated from 2018 to 2024. By type, the global emergency medical emergency service product market is segmented into patient monitoring equipment, patient handling equipment, wound care products, infection control consumables, personal protection equipment, and life support and emergency resuscitation equipment. By application, the market is classified into cardiac care, trauma injuries, respiratory care, oncology, and others. By end-user, the market is segmented into hospitals and trauma centers, ambulatory surgical centers, and others. The regional segmentation includes the current and forecast demand for North America, Europe, Asia Pacific, Latin America, and the Middle East and Africa, with their further bifurcation into major countries including the U.S., Germany, France, UK, China, Japan, India, and Brazil. Some key players operating in the global emergency medical service product market include Stryker, Medtronic, Asahi Kasei, Cardinal Health, Philips, GE Healthcare, Smith & Nephew, 3M, Smiths Medical, Becton, Dickinson and Company, Johnson & Johnson, B. Braun, and C. R. Bard.